Life expectancy varies among sick felines. Your best furry friend seems to be losing weight. You take him to the vet, have some labs run and receive some heartbreaking news—it's feline leukemia. Your cat needs you now more than ever. Although his life may be cut short, with proper care, he can live comfortably for several years. Feline leukemia virus, or FeLV for short, has a deceptive name: it's not a kind of cancer, but an immunodeficiency disease. In the initial stage, known as primary viremia, your fighting feline's immune system can develop antibodies that ward off the virus, so it doesn't progress. However, if the virus continues to take over, your cuddly companion will enter the second stage of feline leukemia, called secondary viremia, according to the Cornell University College of Veterinary Medicine. When this occurs, the virus attacks your cat's bone marrow. His immune system weakens and suddenly everyday environmental organisms, like bacteria, fungi and protozoa, can make him violently ill. Cancer and blood disorders are often detrimental results of this stage. Once your sick friend reaches the second stage, he can survive comfortably for several months with the proper care. 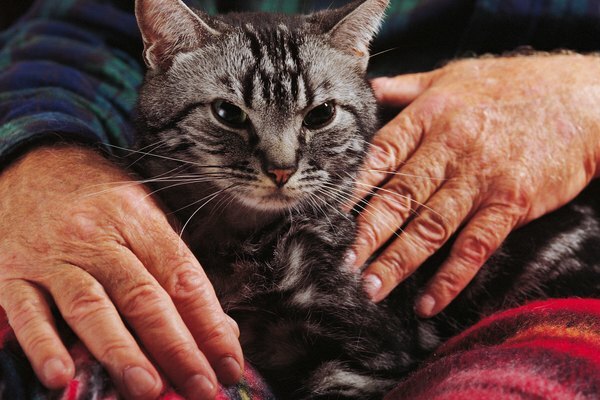 In some cases, cats with feline leukemia live for up to three years after diagnosis. In fact, roughly 20 percent of infected felines live more than three years, although quality of life may be diminished, explains the ASPCA. During this time your cat will be very susceptible to a variety of illnesses, so make sure to keep a close eye on her health and take her to the vet if you notice anything unusual. There is no cure for feline leukemia. If it leads to cancer in your fluffy pal, chemotherapy can treat the cancer, which may prolong his life slightly. Although chemo may keep your best animal friend in the family for one more Thanksgiving, he might not act like his normal playful self—though it's true that cats tend to suffer far fewer side effects from chemo than humans. Talk with your veterinarian about all your options. Depending on the stage of Felix's disease, you may be able to keep him comfortable at home. However, if he has a persistent fever or chronic weight loss, or if he is suffering from an uncontrollable cancerous tumor, sadly, he may have to be put down. While this disease is not 100 percent preventable, the feline leukemia vaccine lowers your kitty's risk of contracting the disease. Generally this vaccine is given only to cats who spend time outdoors, because an exchange of fluids with an infected cat is necessary for transmission—if your kitty spends his days lounging on the sofa, he isn't at risk. Your veterinarian can help you determine if the feline leukemia vaccine is right for your cuddly buddy. If you have multiple cats and one tests positive for feline leukemia, you'll need to have the others tested. Cats cannot transmit the virus to humans or other animals, but they can infect each other by sharing water, food or even litter boxes. Can Feline FELV Cause Cats' Lungs to Fill Up With Fluid?